We’ve reimagined the basics and started over with a new look and feel. You’ll find intuitive navigation with a clean, responsive design that works on any device, from your desktop computer to your phone. Your homepage is tailored to your role on campus, with content that’s relevant to you. 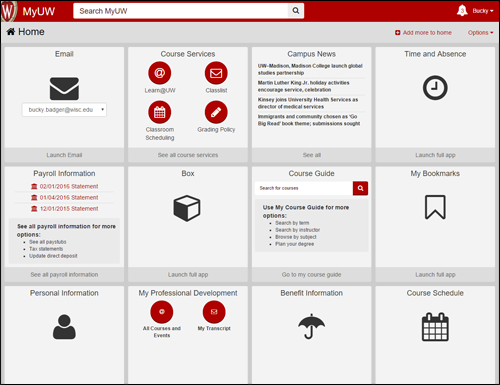 To learn more about how to use the new MyUW, check out the Welcome to MyUW Guide. MyUW is a work in progress, reacting to our users’ feedback to make it better. Try the new MyUW now! What if I don’t like the new MyUW? First, we’d love to get your feedback so we can make it better. If you’re just having trouble learning how to use the new MyUW, the DoIT Help Desk can give you one-on-one guidance. If all else fails and you’re still unhappy with the new MyUW, you can switch back to MyUW Classic with the link on the bottom of the page.